Many of the air plants are Tillandsia. This genus of plants has around 550 + species. They are primary evergreen perennial flowering plants from the family Bromeliaceae. This is native to the forests, mountains and deserts of the West Indies and from Southern US all the way through to South America. These plants grow without soil. The moisture and nutrients needed are absorbed through the leaves. The roots are present to give attachment points to rocks, wood, or any of the other places it can thrive. These plants are not parasitic. They do not depend on a host to survive. These plants can not only survive, but thrive in a wide temperature range. From just above freezing up to 100 degrees. It can take about a month for the plant to acclimate to an environment. They are hardy, and adaptable to so many conditions that it is very difficult to kill them. 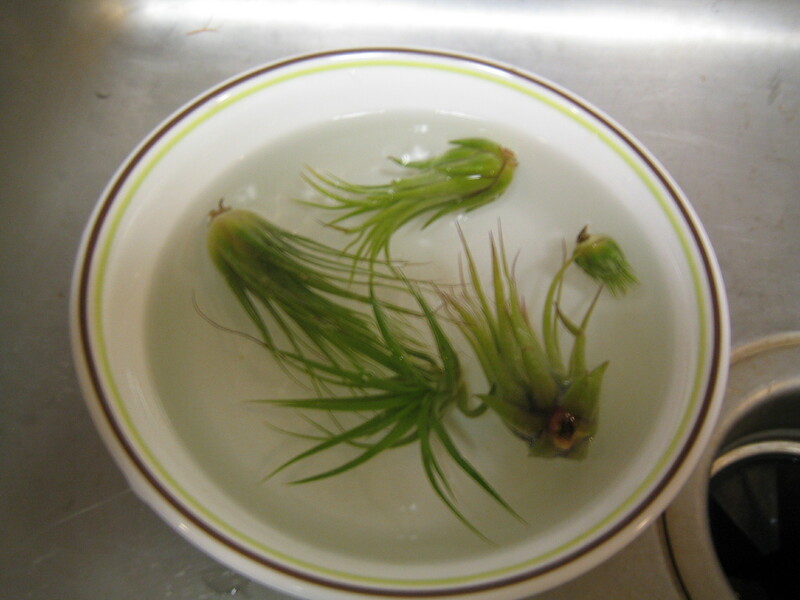 An air plant will not grow in water, or in traditional soil. They can be set in or on a sand or tied to something. It is not advisable to use copper wire or superglue, as these will kill the plant. As will damaging the fleshy part of the plant with staples or nails. Now, we have covered the background information on air plants, we can get into my new leafy children. I purchased 5 air plants via Amazon. Once I received the plants, and removed them from their box. They immediately go into a bath of room temperature water to soak for a minimum of 1 hour. 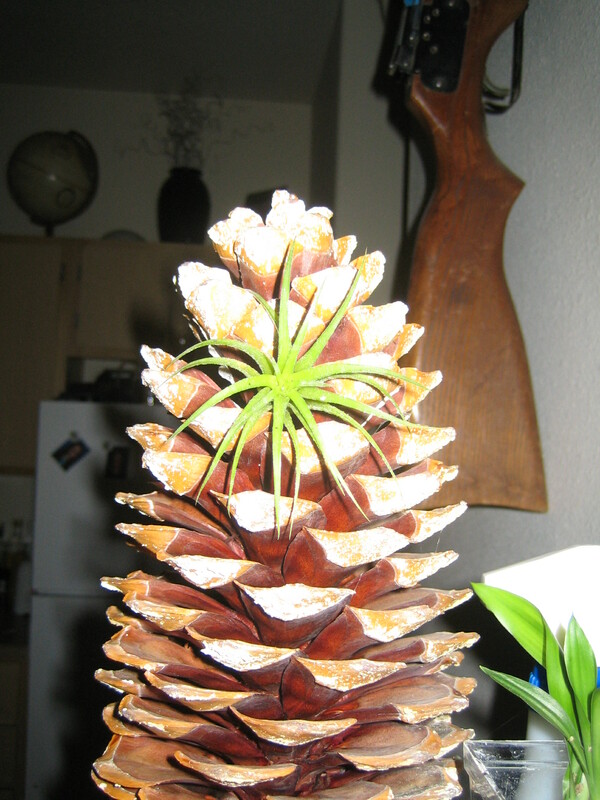 A while ago I received some lovely giant sugar pine cones. My plan since receiving these gorgeous cones has been to put some type of plant in them. After researching plants the air plant became the top choice. I had considered succulents, but I fear that the water needs for those plants will cause the cones to deteriorate. These cones are over 5 years old, and have not been treated with anything. 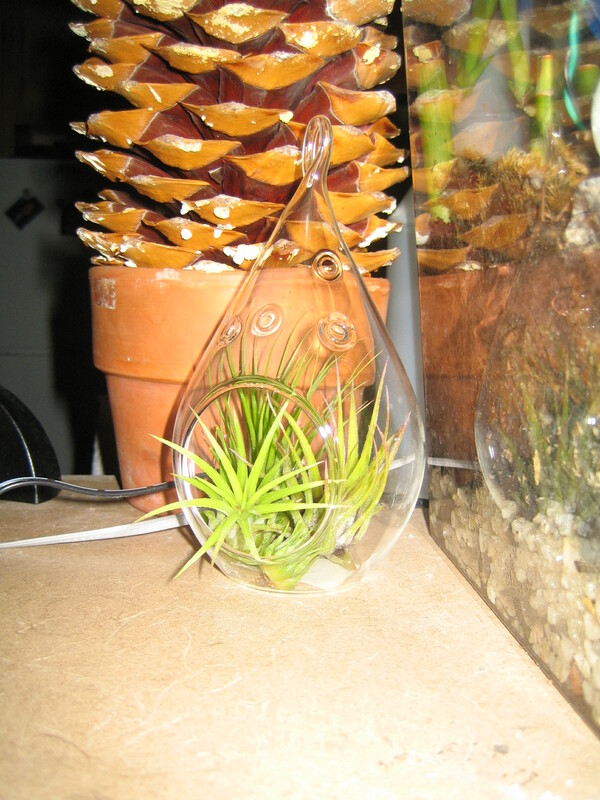 I am concerned that the pH of the pin cones (between 3.2 and 3.8) may be too low for the air plants. The research I have done show they thrive in a pH between 5.5 and 6.0. Now I use city water to water all my plants, and it is normal for that to be pH 8.0. 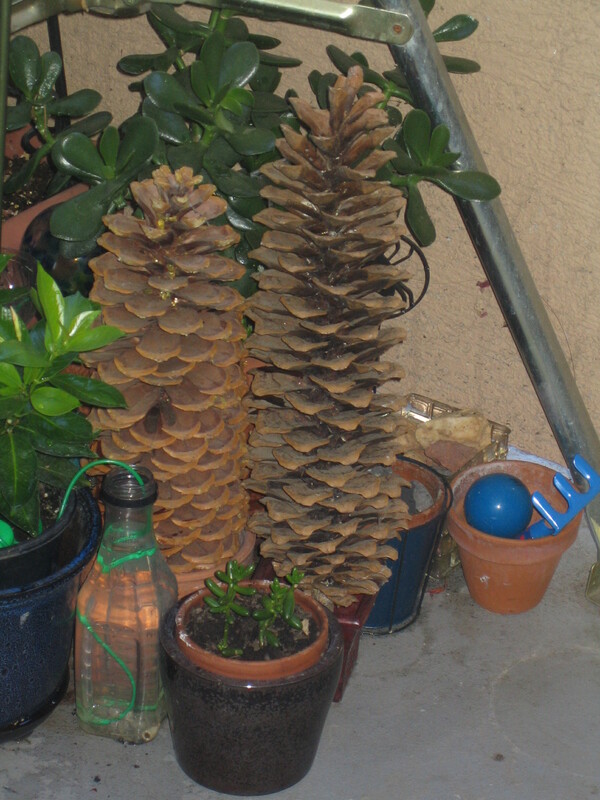 My plan is to try one plant in the pine cone for a while to see how it does. The remainder of my air plants safely tucked into a glass globe. Ionantha Mexican tucked into a Pine Cone.